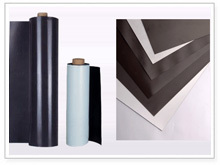 Flexible magnetic sheets are made by strontium or barium ferrite powder mixed with polymers. Thickness range: 0.4mm-5mm. Standard tolerance : Length/Width :+1mm. Thickness: according with the customer�s requirement. Higher tolerance is available upon request . Magnetizing: Standard multipole pitch :2mm,2.5mm ,3mm, 4mm, 5mm,. 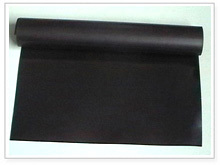 Various coating on the magnetic sheets are available ,such as PVE UV oil , etc. Normally supplied in rolls. We can also print artwords and diecut on you request . The products are used as toys ,novelties ,sales promotions, visual aids, display boards, decoration items ,signage, advertising specialties ,and so on. UV coating is available for exceptional outdoor weather ability and anti-stick when stacked on .Vinyl (PVC) and Pressure Sensitive adhesive(PSA) backing is available in special alit width(min .50mm). Customer�s lengths on quantity orders. 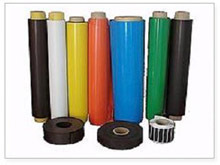 Splice �free rolls on request .Available thickness (plain) :0.4mm-1.0mm Tolerance :Cut length 0.2mm, width 1mm, Thickness 0.05-0.07mm Higher tolerance is available upon request . Please inform us for more information about coating and cut ability of magnetic sheet.